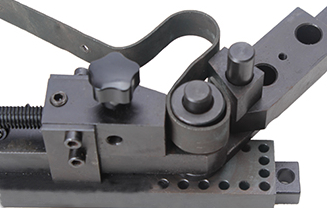 Bending machine must be fixed on the jaw vice or T slot of machine tool stably. Using two 13mm shafts, keeping the bending workpiece between block and fixed axis, then rotate the handle a quarter circle, a 90° circle arc lasts. Choosing corresponding specifications of the circle, keeping the workpiece between activity block and circle, loosen the handle after rotating the handle to the right angle, moving the workpiece clamping point then to rotate handle step by step, until the ring form as shown in figure. According to the size of the workpiece to select the size of the circle, the circle material can be half a circle, circle, arc curved shapes such as bending. Choosing a appropriate circle and angle module, catching a sheet end between them, loosen the handle after rotating the handle to the right Angle, move the workpiece clamping point to rotating handle, step by step, until the ring form as shown in figure. 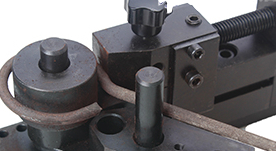 We can transform clamping points, bend the workpiece of any shape. 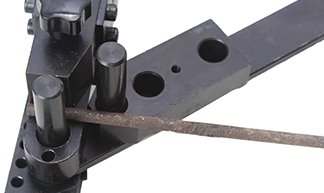 When you need to bend more than two of the same length, you can use the set rule to locate the workpiece length. Inserting the set rule into the set hole in universal bending machine, while adjusting to a appropriate length, tightening the small knob is ok. 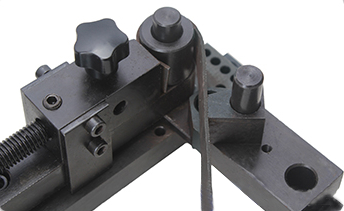 Using a appropriate angle module, adjusting the set rule to the appropriate size, clamping workpiece as shown, which can bent square workpiece, increase work efficiency and the accuracy of the workpiece.